Ensiferum is a Folk Metal band from Helsinki, Finland. While most people would say that they're viking metal, the truth is that Finland and vikings have virtually no connection to each other. Ensiferum makes what could be called, "Kalevalian Metal," metal based off of the great Finnish epic, The Kalevala. Markus Toivonen played guitar with some friends in a band called ”Dark Reflections” which played mainly covers of certain heavy metal bands including Megadeth, Pantera and many others. Later on Markus felt that the band in which he was playing offered him very little inspiration and wanted to play something different. Markus was hugely inspired by folk music and also found himself fascinated about melodic death metal bands, like Amorphis and Dark Tranquility. Then one day Markus asked the band’s drummer, Kimmo Miettinen, if he wanted to play heroic folk ’death’ metal with him. Kimmo agreed. Next Markus and Kimmo asked their friend Sauli Savolainen, if he wanted to come and play the bass. Fortunately he said yes. Now they had a band. Only trouble was that the band had no name at the time. One day Markus was visiting Sauli at his home, when he found a book. A Latin Dictionary. Markus casually opened the book. And from the first randomly picked page he glanced at a word. 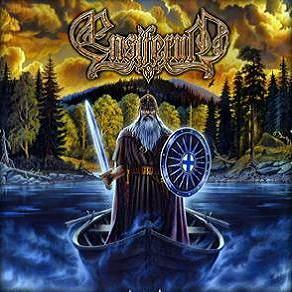 Ensiferum. Markus found the word fascinating and when he read the translation he got really excited of this word when it meant "sword-bearing". Ensiferum started its training in January 1996 at the Pasila Youthcenter in Helsinki (the same place their earlier band Dark Reflections had their rehearsals). Markus begun writing songs in 1995, which he got finished later 1996. 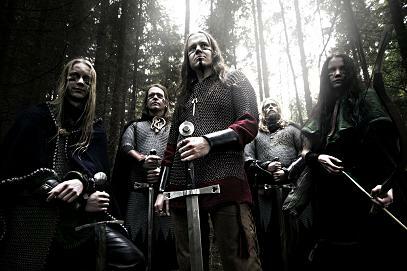 The songs were ”Knighthood”, ”Old Man (Väinämöinen)” and ”Frost”. Later in the same year Markus lured Jari Mäenpää (at the time a member of a band Immemorial and an experienced solo artist) to join his band as a singer and a second guitarist. Jari came aboard with some great skills and excellent musical ideas. Thus the band was no longer a trio, but a quartet. Jari proved to be a skillful lyricist and wrote the lyrics on ”Old Man”. The two other songs required no new lyrics for Jari to write, because Markus had done the original lyrics on ”Knighthood” and Sauli to ”Frost”. So Jari just improved them. Ensiferum had their first concert at Pasila Youthcenter in December 1996. Ironically, they performed just one song, ”Old Man”, which was the only song including finished lyrics. 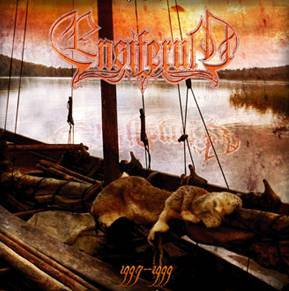 Jari finished his duty in the army in the fall of 1997 and Ensiferum started training heavily for the first demo, which was recorded at Kivi-Studios in November. The demo included three songs, ”Frost”, ”Old Man” and ”Knighthood”, and the demo had the spread of almost 300 copies in the following year. At the release of the demo Ensiferum did yet another two concerts in Pasila. New songs got finished, including ”Little Dreamer (Väinämöinen II)”. But Ensiferum had to take a little breather. And things didn’t get any easier because Kimmo Miettinen joined the band ArthemesiA and Sauli Savolainen concentrated on his job and school. That year Oliver Fokin had quit playing drums in ArthemesiA and had a few short jamming sessions with Markus in an old bomb shelter at Munkkiniemi, Helsinki. One thing led to another and Oliver agreed to play drums in the band. So one might say that Ensiferum and ArthemesiA had a change of drummers. Roughly about the same time Sauli was freshed out of the inthusiasm toward Ensiferum and was replaced by Kimmo Miettinen’s little brother, Jukka-Pekka Miettinen. Funnily, at the time he started to play bass in Ensiferum he was only fourteen years old. Now there was a new line-up ready to head the challenges of the second demo. And they had a new training facility: the bomb shelter in Munkkiniemi. The second demo was recorded in January 1999 at MD-Studios. The demo included 4 songs: ”The Dreamer’s Prelude”, ”Little Dreamer (Väinämöinen II)”, ”Warrior’s Quest” and ”White Storm”. 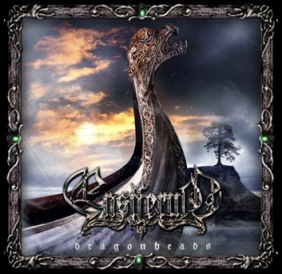 The second demo was technically evolved and although it missed narrowly giving a record deal to Ensiferum it gave confidence to the band. They gained more experience in a local band contest and after that they started to record their third and final demo in November 1999 once again at MD-Studios with the help of Janne Joutsenniemi (a member of Stone and Sub-Urban Tribe) who recorded and mixed the demo in a very short studio session. The demo included 4+1 songs: ”Intro”, ”Hero In A Dream”, ”Eternal Wait”, ”Battle Song” and a bonus song ”Guardians Of Fate”, which was recorded at Jari’s home with a drum machine. ”Eternal Wait” had a guest female vocalist Johanna Vakkuri, a friend of the band. The demo was released with a new band logo, which was designed and conceived by Tuomas Tahvanainen, the same guy, who designed the two earlier logos. The third demo had great reviews and was awarded to be the top demos of the month in several different publishes. And it also got the eagerly awaited attention amongst the record labels. 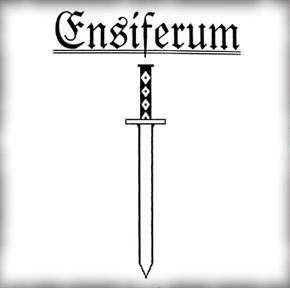 Once Spinefarm record company got hold of the demo they contacted Ensiferum immediately and started negotiating about the possibility of a record deal. In the meanwhile, Ensiferum went in a local band contest and was among the top finalists of that year. Roughly the same time a record deal was finally made with Spinefarm. 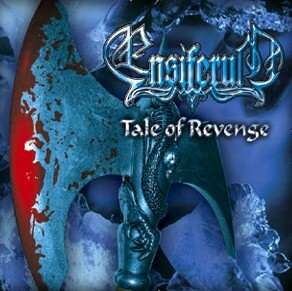 Ensiferum recorded their debut album in November 2000 at Sundi-Coop Studios in Savonlinna with Tuomo Valtonen (studio engineerer). The album featured such guest musicians as Trollhorn (keyboards), Johanna Vakkuri (guest female vocals) and Marita Toivonen (kantele). In the spring of 2001 the debut album was mixed by Tuomo Valtonen in his studio. Tuomo Valtonen made the record ballsy, as he always does. At similar times Ensiferum had a new addition to it’s line-up: a keyboard player. Meiju Enho joined Ensiferum and so the band became five-membered. 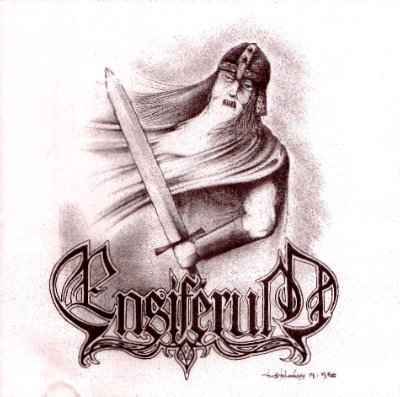 Debut album ”Ensiferum” was released in July 2001 and the feedback was tremendous. 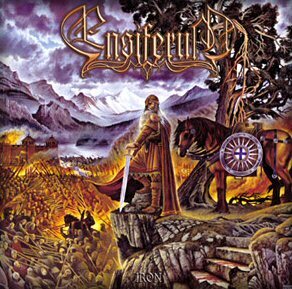 To record "Iron" Ensiferum traveled all the way to Copenhagen's Sweet Silence studios in the summer of 2003. The reason for choosing a foreign studio was the studio´s owner, the famed producer Flemming Rasmussen, who has in the past recorded and produced such famed albums as Metallica´s "Master of Puppets" and "Ride the Lightning". "Iron" was then recorded, produced and mixed by Rasmussen. After the recordings Ensiferum announced with a sad heart that their singer/guitarist Jari Mäenpää had made the decision of leaving the band in order to focus on his new project, Wintersun. The search for a replacement was started immediately due to the band´s busy touring schedule, and soon a new singer was found in the form of Norther´s lead singer Petri Lindroos. Soon after, both Jukka-Pekka Miettinen and Oliver Fokin left the band as well, leaving Markus the only member from the original line-up. They were replaced by Sami Hinkka ( bass guitar )(previously a member of Finnish melodic death/doom band Rapture ) and drummer Janne Parviainen of Sinergy and Barathrum fame. 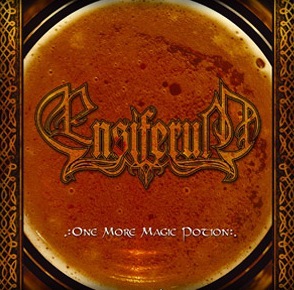 Understandably, the fans didn't expect Ensiferum to be able to keep up to the standard they themselves created, but the DVD marking Ensiferum's 10th anniversary showed great promise for the future, and the new album, "Victory Songs", was generally well received. As was the single "One More Magic Potion" released earlier in 2007. This single included the new song One More Magic Potion, and a cover from Uriah Heep, Lady In Black. The sound remained mostly unchanged, though the new vocals are obviously different and the overall sound is more aggressive. After being with the band for almost 6 years, Meiju Enho decides to leave the band. You can read her statement on the Ensiferum website here. "Emmi Silvennoinen from the band Exsecratus has been substituting Meiju from the beginning of this year (2007) and continues to act as the live/session keyboard player for Ensiferum until further notice."